Arduino, Teensy, and related microcontrollers provide a virtually limitless range of creative opportunities for musicians and hobbyists who are interested in exploring "do it yourself" technologies. Given the relative ease of use and low cost of the Arduino platform, electronic musicians can now envision new ways of synthesizing sounds and interacting with music-making software. 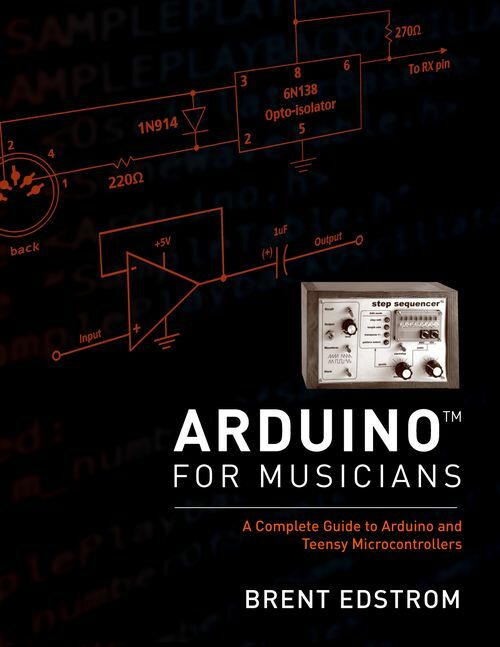 In Arduino for Musicians, author and veteran music instructor Brent Edstrom opens the door to exciting and expressive instruments and control systems that respond to light, touch, pressure, breath, and other forms of real-time control. He provides a comprehensive guide to the underlying technologies enabling electronic musicians and technologists to tap into the vast creative potential of the platform. Arduino for Musicians presents relevant concepts, including basic circuitry and programming, in a building-block format that is accessible to musicians and other individuals who enjoy using music technology. In addition to comprehensive coverage of music-related concepts including direct digital synthesis, audio input and output, and the Music Instrument Digital Interface (MIDI), the book concludes with four projects that build on the concepts presented throughout the book. The projects, which will be of interest to many electronic musicians, include a MIDI breath controller with pitch and modulation joystick, "retro" step sequencer, custom digital/analog synthesizer, and an expressive MIDI hand drum. Throughout Arduino for Musicians, Edstrom emphasizes the convenience and accessibility of the equipment as well as the extensive variety of instruments it can inspire. While circuit design and programming are in themselves formidable topics, Edstrom introduces their core concepts in a practical and straightforward manner that any reader with a background or interest in electronic music can utilize. Musicians and hobbyists at many levels, from those interested in creating new electronic music devices, to those with experience in synthesis or processing software, will welcome Arduino for Musicians. Brent Edstrom is the author of several books, including Recording on a Budget and Musicianship in the Digital Age. An avid programmer, he has used a variety of programming languages to create custom ear training, music synthesis, and music notation applications, and has taught courses in music and computer science. He is a professor of music at Whitworth University.